HARDIN ELMORE. 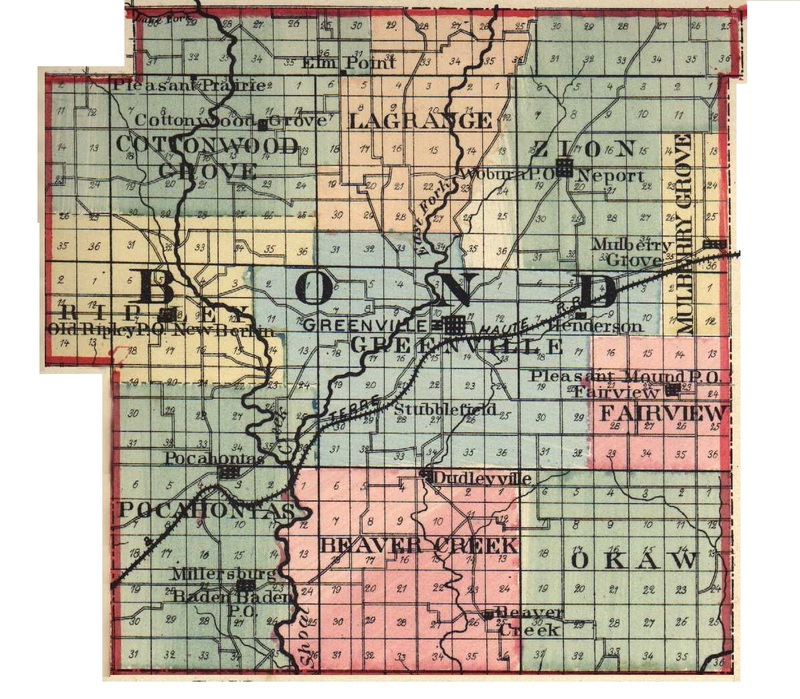 The gentleman whose sketch we now purpose to place before the public is a prominent farmer of Zion Township, and is located on section 12, in this township, Bond County, Ill. He was born in Russell County, Ky., August 19, 1826. He owns four hundred acres of fine land and is a man well known in this locality. The father of our subject was Hiram Elmore and he was a native of North Carolina but was reared in Kentucky. His father died about the time he was born and his mother (our subject's respected grandmother) died in Bond County at the age of one hundred and five years. The mother of the gentleman of whom we write was Sarah Walker and she was a native of Kentucky, where she was born and reared. Her father was James Walker, and he was an early settler of Montgomery County, Ill. The father and mother of our subject were married in the State of Kentucky, where they located, but came to Illinois in 1830 and settled in Bond County, within Mulberry Grove Township, there improved laud which was obtained from the Government. In 1831 they moved upon the farm where our subject now lives. They were enterprising people and were willing to make the best of circumstances. They lived in a rail pen for a time, until they could get the log cabin built, and enjoyed the life when the wolves were not unusually bold. Those were days when luxuries were not thought of and where a contented mind gave more comfort than much money does in these extravagant times. The mother died many years ago, and the father married again, his second wife being Miss Lucy Curlee. From the first marriage eight children resulted and from the second there were two. Our subject is the oldest child of the first marriage, and he has two sisters living. He was four years old when he was brought into Bond County, and he remembers the first school he attended. This was kept in a little log house, 12x14 feet, and in this temple of learning the foundations of his education were laid. The young man remained at home until the year 1846, when he enlisted in Company E, Third Volunteer Infantry, for the war with Mexico under Col. Zenas Foreman. Although not wounded, our subject felt the effects of the war for three years after, as for that time he was sick. The first marriage of Mr. Elmore was with Miss Sarah Secrns, and at her death she left three children, but only one remains at this time. This is Mr. Russell Elmore, who resides in Mulberry Grove. The second marriage of our subject took place July 14, 1864, to Miss Mary E. Roberts, a native of Bond County, and the daughter of Richard S. Roberts. Five children have been born of this marriage, Frank, Martha, Florence, Elizabeth and Lafayette. The large amount of land which Mr. Elmore has under control numbers him among the land princes of the township. Almost all of it he has under cultivation and upon it he carries on general farming and does well in raising stock. He has a preference for the Jeffersonian principles of the Democratic party, and the ideas of that party upon tariff and taxation of all kinds meet his approval. His family is one well known and highly regarded in the neighborhood. Extracted 21 Dec 2016 by Norma Hass from 1892 Portrait and Biographical Record of Montgomery and Bond Counties, Illinois, page 510.